Surprise bonus! 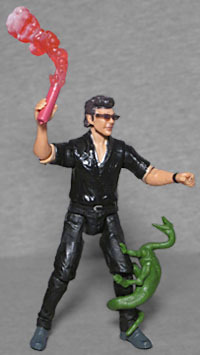 I guess action figures, uh, find a way. Taking a calculated risk, supercool mathematician Ian Malcolm gets in on the action and helps lure T-rex away from the kids. What are the odds he'll live to regret it? That text, like all the bio paragraphs we've included in these Jurassic Park Legacy Collection reviews, comes not from the packaging of these toys (which has nothing of interest to say, just copyright info and multi-lingual blurbs about the accessories), but rather from the collector cards that were included with Kenner's original line of JP toys back in the mid-90s. With that in mind, it's impressive how perfectly copy written in 1993 suits a toy released in 2018. It's not like that's the only thing Malcolm does in the entire movie, you know? Taking a cue from Albert Einstein, Ian Malcolm explains that he only wears two colors, black and gray, because he doesn't want to waste his life thinking about clothing; but it also fits with the Biblical allegory we mentioned in the Ellie Sattler review: she's the story's Eve, and here comes Ian Malcolm, slithering in to tempt her with his knowledge of chaos and the fact that life cannot be contained within this paradise. His black clothes even make him the opposite of the white-clad John Hammond, who designed and built the park (in probably more than seven days, but still). 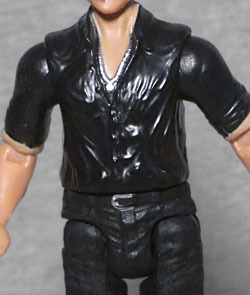 Since this toy is from the night scene, Ian has shed his leather jacket, and so is wearing a short-sleeved black shirt, black trousers, and grey shoes. Also a black watch. [Plaid! --ed.] His shirt is open slightly - not quite this far, but enough that we can see his silver necklace. This is not the first time we've had a Jeff Goldblum figure; it's not even the first time we've had a Dr. Ian Malcolm, thanks to the same lineup that brought us Secret Agent Nedry (and honestly, it was one of the better representations in that entire line). The facial sculpt here looks good from some angles, but from others, it looks like Mickey Rourke after some so-so plastic surgery. The glossy paint is the same way Hasbro's "Photo Real" process looks, but this definitely isn't that good. This toy also wins the award for 2018's "Most Likely to be Lost" accessory, as his glasses are removable. They're molded from smoky translucent plastic, and attach to the figure's face via small bumps that fit into divots on his temples. It's kind of amazing they took that route, even if you're liable to knock them off and lose them forever. So be careful. The Legacy Collection figures have thus far not had tremendous articulation, and Dr. Killjoy isn't changing anything now. Like the other three figures, he moves with a balljointed head, a swivel waist, then swivel/hinge joints in the shoulders, elbows, hips and knees. Other than the glasses, he's accessorized with the road flare he used to distract the T rex. It's been molded from a translucent red plastic, then given a solid app on the body of the flare itself, and a white airbrushing at the end of the smoke. Surprisingly effective! He also comes with a small green Compy, and yet again it's not a mold shared with any of the others - this one has its tail curled around whatever limb it's hanging from. Seriously, props to Mattel for not cutting corners on the pack-in dinos. It's more than we expect from them. Once Dr. Sattler made it to stores, it seemed like this line was over - so I was shocked to spot Malcolm on the front of the pegs when I went to Target earlier this week. If they really want to wow us, though, we're going to need a shirtless, "laying on table" version of him.